Can a Christian vote for Barack Obama in good conscience? If you’re a Christian, do you have to be a Republican? 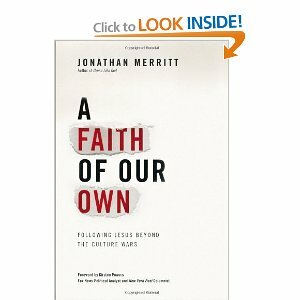 In his book A Faith of Our Own, Jonathan Merritt tackles questions like these as he argues that Christian leaders have become too focused on gaining political power and influence and less on living the Gospel. In fact, Merritt argues, many younger Christians are less likely to be staunchly Republican or even care so much about the political issues Christian leaders are concerned with. When today’s young Christians look at the Bible, they see Jesus providing help to the poor, those down on their luck and sinners of all types, regardless of what was considered acceptable by religious and political leaders at the time. So to them, issues such as whether gay marriage should be legal is less important than making sure homosexuals still experience the love of Christ. Banning abortion take a backseat to loving on women who are even contemplating an abortion and helping them through trying times in their lives. His point is clear. Today’s Christians need to be driven by faith, not politics. Instead of keeping people out of the faith through narrow viewpoints and divisive politics, we need to be welcoming people in, humbling ourselves to accept people and their imperfections and showing them the same love that Jesus showed sinners and his enemies. Whether you choose to vote as a Democrat, Libertarian, Republican or abstain from voting altogether, your commitment to Christianity is defined not by politics, but how you show love.